They mark the transition from our reality to another. They seem to belong to that beginning of terrible life which the dreamer sees confusedly through the loophole of the night. 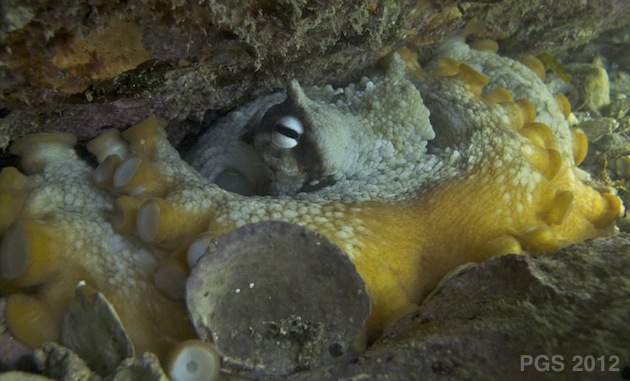 Octopuses, the most celebrated of the cephalopods, are full of mysterious behaviors and surrounded by tall tales. Here’s one who seems likely to give Victor Hugo bad dreams. This species is Octopus tetricus, the Gloomy Octopus. In many ways octopuses have a similar body plan to cuttlefish and squid. They all have eight arms surrounding their mouth, a recognizable head, and a mantle behind the head. Octopuses don’t have the two extra “feeding tentacles” that squid and cuttlefish have in addition to the arms. But a bigger difference is that an octopus’ body contains almost no hard parts at all – there is no surfboard-like “bone” beneath their back, no joints, no skull. The only hard parts are the eyeballs and a small beak within the mouth. Nothing else constrains the endless transformation of their body shape. Much of an octopus is made up of the arms – extending to several times the body length, bending in all directions, and lined with suckers. The arms are also packed with neurons (nerve cells). Though octopuses have big brains, about 2/3 of an octopus’ neurons are in the arms themselves. What are those neurons doing? This is something I’ll spend a lot of time on in this blog. The possibility raised is that an octopus has a very different kind of intelligence from us and other vertebrates, one that involves a different relationship between brain and body. Here is a video (about 30 seconds) of an octopus moving about on the sea floor. The color is not great as the video was taken fairly deep with natural light. But it shows some of their uses of color and the way they move around. The octopus is directing some sharp color changes at fish – those Leatherjackets attack in packs and are very dangerous for an octopus. China Miéville, a novelist who has written a fantastical, black-comedic, and cephalopodic thriller called Kraken, sent an article containing an apt complement to the Victor Hugo quote at the top of this post. In 1916 the anthropologist Roland Burrage Dixon collected the myths of the Pacific region in his Oceanic Mythology. According to Dixon, the Hawaiian creation myth is one of evolutionary struggle, in which the octopus occupies a special place. 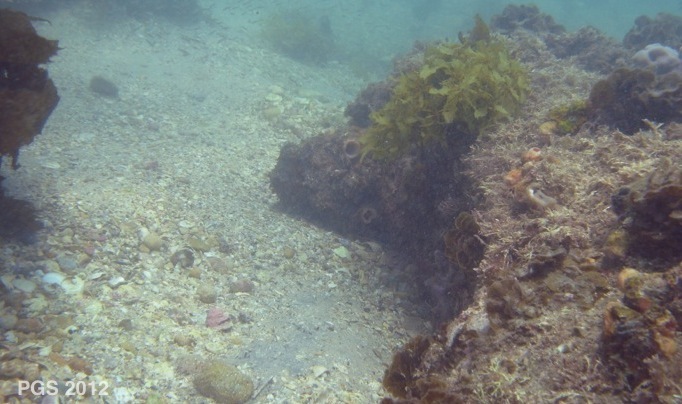 At first the lowly zoophytes and corals come into being, and these are followed by worms and shellfish, each type being declared to conquer and destroy its predecessor, a struggle for existence in which the strongest survive. Parallel with this evolution of animal forms, plant life begins on land and in the sea — at first with the algae, followed by seaweeds and rushes. As type follows type, the accumulating slime of their decay raises the land above the waters, in which, as spectator of all, swims the octopus, the lone survivor from an earlier world. More on Miéville and Oceanic Myths to come. Posted in Bodies and Minds, Octopus and tagged octopus. permalink. I think I would have, though it might not have done much good. 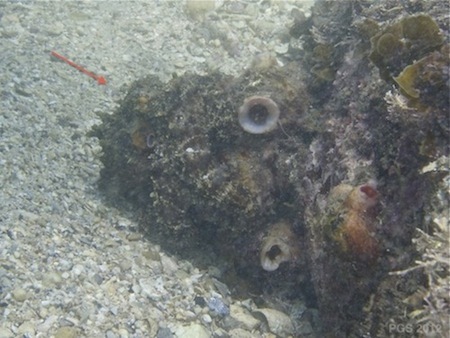 Here is a video – graphic and quite disturbing – of the same kind of fish killing an octopus nearby to this site in 2010. This was taken by Matt Lawrence. Would you have intervened had the Leatherjacket group really attacked?